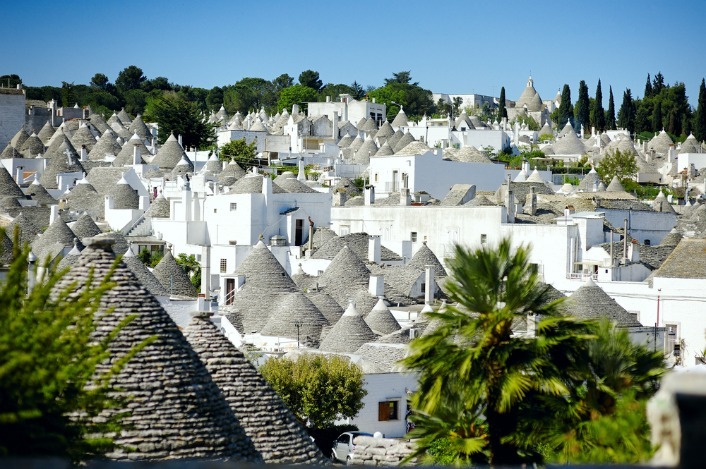 Puglia, or Apulia, is on the heel of Italy’s boot. It is full of southern ebullience, tradition and hidden secrets. For the Italians, Puglia is a bit like the Cape. They come here for the sea, sun and beaches. And they come for the seriously gourmand cuisine fished from the local waters and the fruit and veg harvested from the fertile fields. And, of course, the fine wines. They also come to see handsome towns with intricately carved stonework, mysterious white hilltop villages, the curious conical ‘trullies’ in the fields, the ancient cave houses known as ‘sassi’. Puglia’s architecture has been shaped by invaders, from the Greeks and Romans, to Normans, Saracens, Bourbons, Swabians, Spanish, Byzantine. 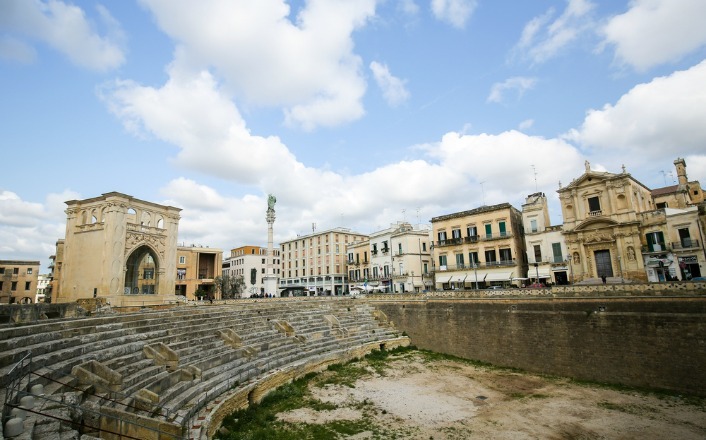 Lecce, described as the ‘Florence of the South’ is a Baroque fantasy, a breath-takingly beautiful classical Italian town with its elaborate Santa Croce basilica, Piazza Sant’Oronzo promenade, Roman amphitheatre and arches. The capital, Bari, has a medieval old town with a tangle of narrow streets, lopsided buildings and artisan front-rooms where you can see ladies making orecchiette, ear-shaped pasta, by hand. There are several gorgeous Adriatic ports like Otranto at the tip of the heel or Vieste on the mountainous promontory ‘spur’, with their golden beaches and dramatic white tufo (limestone) rock formations. Trani, once an ancient trading hub, is a delightfully eccentric port with its white cathedral perched on the seawall, where boats bob on the glistening water while you eat ices and drink unfamiliar glasses of something cool on the piazza. 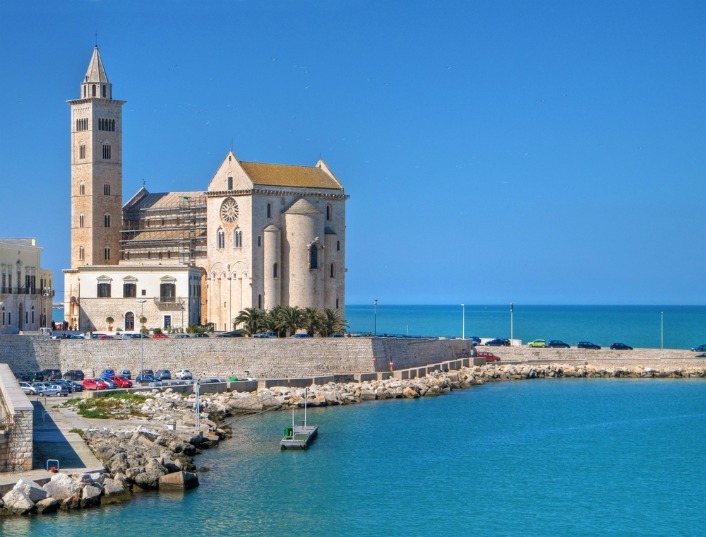 The Adriatic coast is dotted with absurdly picturesque little harbour towns like Trani. As you wind through pretty country roads lined with yellow acacias, you’ll pass silver olive groves (Puglian olive oil is, arguably, the best of all Italy and Puglia provides about 40 per cent of the nation’s exported oil) and vineyard dotted with trullies. Trullies are unique to Puglia, a small drystone circular storehouse with a pointy roof. They were constructed by farmers in their fields to keep their equipment dry and stock protected from roving highwaymen. Built without mortar they could be speedily dismantled when the tax man came round! 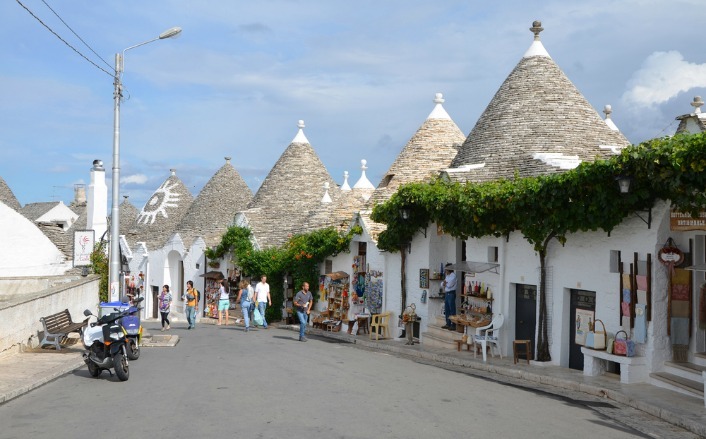 Alberobello is a completely restored trulli village. It looks like bit like a Hobbit town. 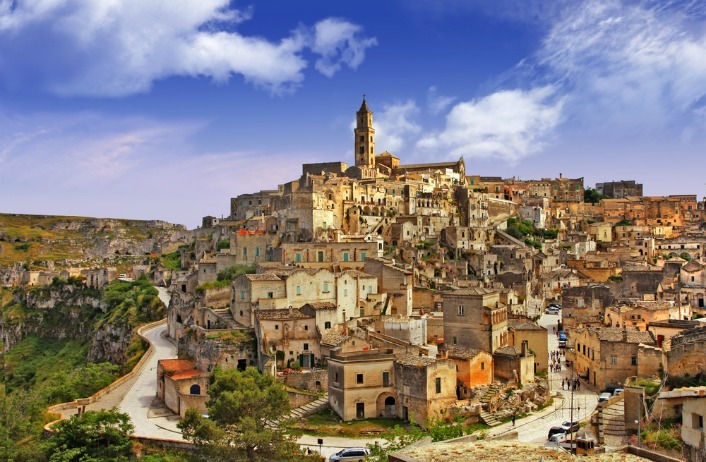 Close by is the ‘sassi’ village of Matera, where troglodytes settled in Palaeolithic times and made their homes in caves. Rising dramatically from a ravine, it could almost be Biblical. (Not for nothing did Mel Gibson film The Passion of the Christ here.) The local authorities rehoused families in the fifties but some are now restored and in use as restaurants and hotels. More stately is the graceful citta bianche (white town) of Martina Franca, with its narrow shuttered streets leading off ornate squares. Nearby is Ostuni, founded in the first century, also all elegant porticos and loggias. Until relatively recently this region has been comparatively isolated. Although now enjoying a cultural renaissance it remains a place with many untold secrets. At times you feel you’ve been transported back in time, drinking espresso in a village that appears to be untouched or walking across wild land that still seems unexplored. 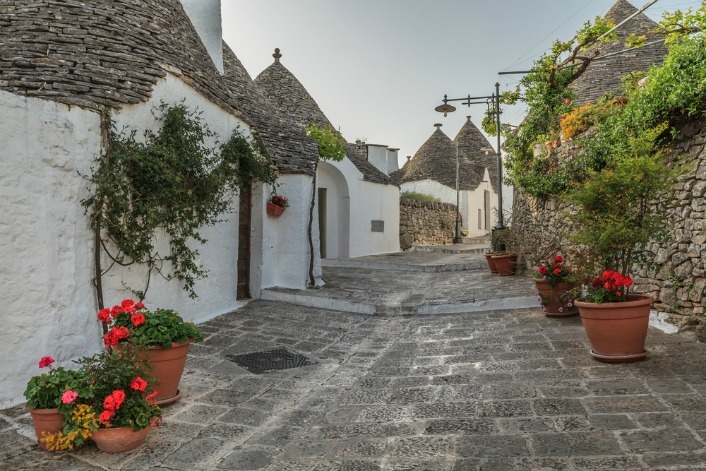 Go before Puglia becomes the ‘new’ Tuscany!